The last three years recorded a reduction of the resources allocated to public education (total expenditure, per student, and the worsening of the ratio teachers/pupils). although it still maintains the rate of people perceptoras of scholarships. The school results were registering a positive evolution between 2007 and 2010 that can deteriorate due to the growing restrictions that have given rise to important mobilizations. As is well known, the policies adopted since 2010 to deal with the crisis in course give priority to the “fiscal adjustment”, that is to say, the cutting of public expenditure to reduce the budget deficit and cope with the increasing weight of the debt. In the field of education, public expenditure had experienced an increase of 17.9% between 2005 and 2009 (from 4.3 to 5,07% of GDP), exceeding clearly the figures registered over the previous decade. 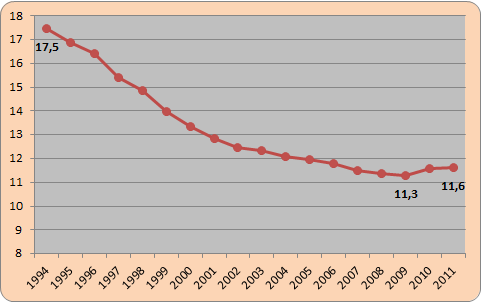 With the same government (PSOE) in power in the following two years there was a decline to 3.6% (from 5,07 to 4,89% of GDP in 2011) and 2.7% in the year 2012 (4,76% of GDP) with government of the Popular Party. In absolute terms the fall in education spending is even more serious, because we have to take into account that in the last three years the GDP has regressed more than 5% (see Chart 1). Beyond the macroeconomic figures, the recoil becomes more clear when we analyze the decrease of expenditure per student: -7,8% between 2009 and 2011 (from 6.457 to 5.951 euros). Source: Ministry of Education. Development of the social Barometer of Spain, field Education. Among the courses 2009-10 and 2011-12 the percentage of students enrolled in public centers providing non-university education has increased by 7.7%, almost double that of those enrolled in private centres, concerted or not (by 3.4%). This evolution could be assessed as positive, to the extent that public education could be a mechanism of integration and improvement of equal opportunities. However, the measures of cuts have led to a deterioration of 3.1% in the ratio teachers/ students (in 2009-10 was 11.3 and in 2011-12 11.6); the change is not quantitatively very significant, but it breaks a trend of improvement uninterrupted since the beginning of the years ’90. In this context of deterioration in general we find a positive trait in the percentage of students who have been granted any scholarship aid to study. 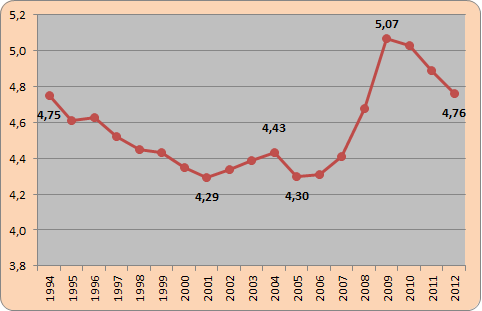 This figure declined markedly between 1995 and 2000 (from 8.5% to 5.3% of the student body) and more slowly until 2006 (by 4.5%); since then, there has been a continuous improvement although the data of 2011 (7%) is lower than those registered in the period 1995-1997. Source: EUROSTAT. Development of the social Barometer of Spain, field Education. It also presents a slow but steady positive trend in recent years, the rate of students who have reached 15 years has repeated a course, which increased from 35% to 42% between 1999 and 2007, to descend from then up to 38.8% in 2011. It is, in any case, a very large proportion in the context of the European Union. 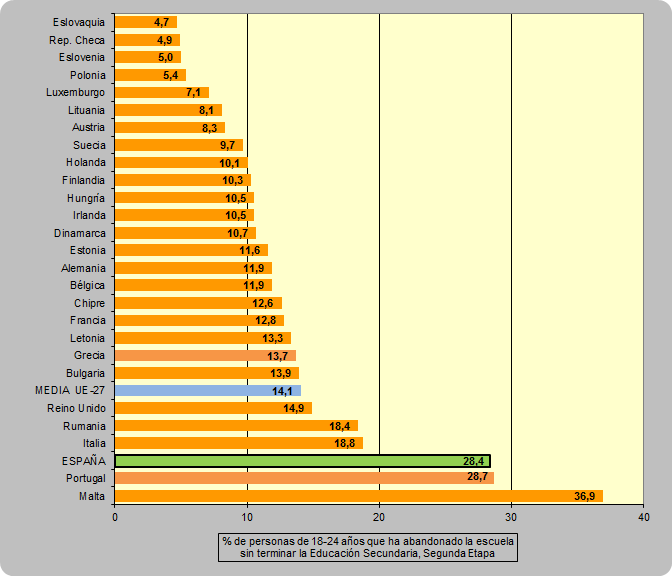 Other indicators of a school’s test results only go up to 2010 and presented in general a positive development, which reflects in some measure the efforts made by the last government of the PSOE in this subject: the graduation rate in high school (with respect to the population 18 years of age) gained nearly four points, from 44.7% in 2008 to 48.6% in 2010; and the graduates as superior techniques and specialists increased from 16,4% to 18,9%. In terms of the graduation rate in THAT (with regard to the population of 16 years), improved between 2006 (69.2%) and 2009 (of 74.1%) but in 2010 stalled. In this last year, the 26% of the population of 16 years could not complete the compulsory schooling. It is still early to assess the effects it can have on the educational outcomes of the policy of cuts that has been applied since the spring of 2010. However, there are many measures that point to a clear deterioration of public education, such as the expansion of the number of students per classroom, cutting of template, the lower coverage of low staff and the corresponding increase in the teaching hours of teachers; cuts in transportation and school cafeterias; increase in the price of tuition, etc, These measures are leading to a strong social response that to date has not succeeded in reversing government policies. 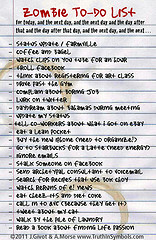 how useful Are the lists of tasks?